The latest project at the Rep Studio is probably the most difficult production I’ve ever had to review. In fact, I’m tempted to just write: “this is really interesting and non-tradtional–go see it!” When audiences are brought into the studio space, they’re given a program for an art exhibition, not a play. Still, they’ve billed it as a play, and the Rep is a theatre company. Although the initial setup isn’t usual, it’s fairly obvious there’s something theatrical going on here. Still, because Caught depends so much on form, and surprise, I’m not going to describe it in detail. It’s not a vague show in any sense, but the structure of it essentially requires a somewhat vague review. So, go see it! Enjoy! Actually, I have to describe it a little. Just be warned that everything is not exactly as it seems, ever, in this production. We first get an art show, and a lecture by a Chinese artist, and then more situations that end up differently than how they start out. There are actors involved, and I have to credit them because of their excellent performances with comic and dramatic twists, but I’m only listing their names here: Kenneth Lee, Rachel Fenton, Jeffrey Cummings, and Rachel Lin. There are also excellent production values–an impressivly detailed, evolving set by Robert Mark Morgan, well-suited costumes by Felia K. Davenport, striking atmospheric lighting by Ann G. Wrightson, and strong sound design by Rusty Wandall. All the elements work together to make this a unique, challenging work of theatre that addresses timely issues of truth in media, as well as the very concept of truth itself. In fact, you’re likely to leave the space not only wondering what you just saw, but questioning the very idea of truth in communication. The Rep’s next entry in their 50th anniversary season is an American classic by one of the greatest playwrights of the 20th Century, Arthur Miller. Although I had seen and read several of Miller’s plays before, for some reason All My Sons had evaded me until now. I’m glad that it’s this production that serves as my introduction. It’s a period specific story that can’t really be updated, as tied to World War II and mid-20th Century American ideals as it is. It would be easy to approach this play as something of a history lesson or artifact. Director Seth Gordon and his first-rate cast and crew, however, will not let us do that. This production celebrates Miller’s brilliant text by bringing it to vibrant, emotional, challenging life. This is a time-specific story definitely, but many of its themes are timeless. The hard working father and factory owner Joe Keller (John Woodson) has spent his life building a business and taking care of his family’s material needs, and he hopes to leave a legacy that will be continued by his son Chris (Patrick Ball). Chris is a World War II vet whose unseen older brother Larry, presumed to be killed years earlier in the war, is still remembered and revered by his parents, especially his mother Kate (Margaret Daly), who insists that Larry will return to his family some day. The idealistic Chris sees a future not necessarily in business but with Ann (Mairin Lee), who had been engaged to Larry. Ann and her brother George (Zac Hoogendyk) grew up next door to the Kellers but moved away after their father, an assistant of Joe’s at the factory, had gone to prison for approving the delivery of faulty airplane cylinder heads and ultimately causing the death of 21 pilots during the war. Joe had also been to prison but had been exonerated, and he tries to maintain his own high standing in the community. The neighbors love Joe. Chris idolizes Joe, but Joe is hiding something that could be devastating to him, his family, and everyone close to him. This is a moral dilemma story but also a rich, detailed portrait and critique of its time. Miller’s sharp, incisive and natural-sounding dialogue makes these characters and their world live and breathe, and there’s humor but also palpable tension. There’s a vivid picture of a family dealing with loss, some wanting to move on and others not able to. There are the highly influential Kellers and their neighbors who live in their shadow, including men with dreams they can’t fulfill, like neighbor and doctor Jim Bayliss (Jim Ireland), and women whose lives are tied to the social and financial stability of their husbands, like Jim’s resentful wife Sue (Amy Hohn) and George’s former sweetheart Lydia (Emily Kunkel), who has settled down with the dependable but unexciting Frank (Grant Fletcher Prewett). It’s a world where financial status and social standing can take precedence over ideals and genuine care. It’s a world where people who have had their lives damaged by war desperately try to find new hope and build lives that mean something. This is a modern tragedy centered on the likable but obviously flawed character of Joe, who is remarkably played by Woodson, who conveys Joe’s affability as well as the increasing desperation of his situation. Daly is just as effective as Kate, so devoted to her son’s memory and living in determined, devoted denial. Ball as Chris is excellent as the handsome, charming, idealistic son who is devoted to his family but wants more from life than what his father can give him. He has strong chemistry with Lee, who gives a strong but somewhat affected performance as Ann. There’s also strong support from Ireland who conveys an underlying sadness to the character of Jim, Hohn as the somewhat spiteful Sue, Kunkel as the good-natured Lydia, and Hoogendyk as the determined but conflicted George. It’s a strong ensemble, serving Miller’s brilliant script well, with Seth Gordon’s direction perfectly pitched, as the sense of tension builds in intensity and leaves a profound, lasting impact. Technically, the production is extremely impressive, with a set by Michael Ganio that is so well-realized, realistic and somewhat fantastical at the same time, as the superb lighting by Peter E. Sargent highlights an important aspect of the set at just the right moments in the play to help reveal an important underlying theme. There’s also excellent sound design by Rusty Wandall and remarkably detailed, just-right period costumes by Myrna Colley-Lee, helping to augment the authenticity of the time and place. All My Sons is a classic for good reason. It’s a story of post-war America, but its themes are just as powerful today as they were seventy years ago. As presented at the Rep, this play’s power and urgency are made all the more effective by the remarkable performances and staging. It’s a truly stunning production. The Repertory Theatre of St. Louis is presenting All My Sons until January 29th, 2017. The Cold War was tense time in American history, and it’s one I remember first-hand, at least to a degree. The threat of nuclear war and the generalized looming sense of dread it created is something I remember well from my childhood and teen years. Molly’s Hammer, a new play currently being presented at the Rep Studio, focuses on the anti-nuclear protest movement that developed as a result of this general threat of war to which the stockpiling of nuclear weapons contributed. Focusing on one key figure in this movement, the play seeks to present a personalized account of this movement and, for the most part, it succeeds. Molly Rush (Nancy Bell) was a Pittsburgh area housewife who had been involved in various Catholic-led activist movements. This three-person play focuses on her increasing involvement in the opposition to nuclear weapons and her involvement with a protest action led by Catholic priest Daniel Berrigan (Kevin Orton, who plays many roles in this production), along with his brother and others. They formed a group known as the Plowshares Eight, and their protest action at a Pennsylvania General Electric plant in 1980 serves as the central focus of this production, including the events leading up to the action and its aftermath. The play also highlights the relationship between Rush and her husband Bill (Jose Osheroff), who loves Molly but isn’t sure what to think about her increasingly activist ways, especially when the threat of imprisonment and separation from him and their children becomes more and more likely. This is an ambitious, inventively structured play, with two performers playing one role each and one performer (Orton) performing a variety of roles with no costume changes to indicate the variations of character. In fact, Orton’s performance is the most impressive simply because it depends so much on body language and line delivery. His portrayals of everyone from Daniel Berrigan to the Rushes’ various sons, daughters, and other family members as well as other activists, a judge, a female prison guard, and more are made convincing due to Orton’s clarity of performance. Bell turns in a fine performance as Molly, as well, portraying her determination and zeal for her cause in a thoughtful manner, and Osheroff is equally convincing as the conflicted but loving Bill, whose mission to convince Molly to temper her activist tendencies doesn’t go exactly as planned. The structure of this play is at times confusing and also a little on the talky side. There’s a lot of talking about things that are about to happen, and a generally linear timeline that occasionally gets interrupted with a flashback, although there aren’t enough of these flashbacks to justify them, and they come across as interfering with the forward progress of the plot rather than augmenting it. Also, the staging can get cluttered with stagehands running on and off stage to change the scene, as Gianni Downs’ scene design mostly consists of a generalized backdrop with set pieces that are moved into place as needed, and sometimes these quick scene changes can come across as frantic and distracting. Aside from the set, there’s a good use of lighting and projections by Mark Wilson, and authentic looking early 1980’s costumes by Lou Bird. Molly’s Hammer is an intriguing play about an important era of American History and a protest movement that generally isn’t talked about as much as others. Its a thought-provoking play led by an amiable cast, although the staging is sometimes muddled. Still, the performances and generally authentic evocation of the era make this show entertaining, educational, and worth seeing. Molly’s Hammer runs at the Repertory Theatre of St. Louis’s Studio Theatre until March 27, 2016. Disgraced is a Pulitzer Prize-winning play that couldn’t be more timely. Raising more questions than it answers, it addresses issues of Muslim identity in American society, as well as faith vs. secularism, and even faith vs. faith. There’s so much here that it can be difficult to process, but it’s a story that’s immediate, demanding, and continually challenging. As the latest production at the Rep, this play is profoundly challenging audiences nightly. Amir Kapoor (John Pasha) is a Pakistani-born lawyer who enjoys a lavish, upper class existence in a beautifully decorated apartment in New York City. He was raised Muslim but doesn’t particularly identify with his family’s faith anymore. His white, non-Muslim artist wife, Emily (Leigh Williams), admires Muslim traditions much more than Amir does, incorporating them into her paintings and drawing the attention of fellow artist and gallery owner Isaac (Jonathan C. Kaplan). When his more devout nephew Abe (Fahim Hamid) comes to Amir for help in defending a beloved imam who has been jailed for questionable reasons, Amir is conflicted but eventually offers a degree of support, which starts a chain of events that changes the lives of Amir and everyone close to him. Much of the action revolves around a dinner party that Amir and Emily host for Isaac and his wife, Jory (Rachel Christopher), a lawyer at Amir’s firm. The conflict between the couples, and the growing conflict between Amir and Emily, as well as the affect of Amir’s actions and beliefs on Abe, generates much of the drama. Isaac’s Jewish identity and exprience, and Jory’s as an African American woman factor into the discussions and conflicts, although Amir and his attitude toward his faith and himself is at the center of everything. His attitudes and actions are what drive the play for the most part, and it’s his reaction to a revelation about Emily that brings the play’s conflicts to a climax. There are no easy answers here, for Amir, for Abe (who changes perhaps the most throughout the play), or for anyone else. The characters are well-defined, and all are flawed in various ways. Pasha, as Amir, projects strength, charm, determination, fear, and anger at various moments in an enigmatic, compelling performance. As Emily, Williams brings out a degree of sympathy for her character as well as a degree of astonishment and conflict. Her scenes with Pasha are often emotionally charged, and believably portrayed. Kaplan is also fine as the ambitious Isaac, and Christopher is a standout as perhaps the play’s most likable character, the equally ambitious Jory. As the young, increasingly troubled Abe, Hamid gives an emotional, riveting performance. He raises some excellent questions about the treatment of Muslims, and particularly young Muslim men, in American society, and his determination and frustration are readily apparent. The setting here is, as usual for the Rep, stunningly realized. The lavishly decorated apartment is impeccably portrayed in Kevin Depinet’s masterful set. Dorothy Marshal Englis’s costumes outfit the characters well, with a decided air of upscale New York style that fits the tone established by the apartment. Abe, dressed in jeans and a t-shirt at first and then later in more traditional Muslim attire, stands out from the more self-consciously sophisticated style of everyone else. Attention is paid to Amir’s expensive shirts, and his high-priced lawyer look lives up to that description. There’s also excellent lighting by Ann G. Wrightson and consummate sound design from Rusty Wandall. While for the most part this production is impeccably staged, I have to mention one extremely awkward moment late in the play. I don’t want to spoil the plot, but I will say that what is supposed to be one of the play’s most shocking moments is unfortunately shocking for all the wrong reasons. The clumsy staging of this key moment is distracting and entirely unconvincing. I hope this staging is improved in subsequent performances because of its great importance to the play. Otherwise, the dramatic moments are timed right and the acting is impressive, and the power of the play’s conclusion is retained despite that one unbelievably staged moment. 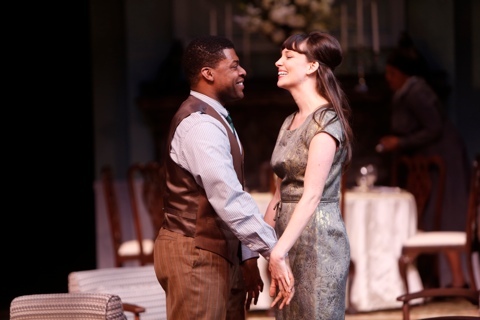 Despite that one notable flaw, Disgraced at the Rep is profoundly provocative production. There’s much to think about, wonder about, and discuss here in Ayad Akhtar’s powerful script. The questions the play raises can be convicting and even disturbing. It’s a profoundly affecting experience. 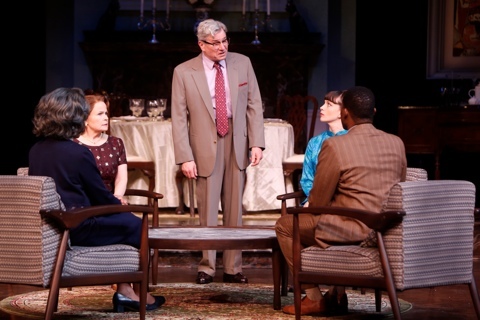 Disgraced is being presented by the Repertory Theatre of St. Louis until March 6, 2016. The 2015 theatre season in St. Louis coincidentally started on my birthday this year, which is wonderful because I can’t think of a more appropriate present. I’ve been continually impressed with the quality and variety of live theatre in St. Louis, with Rep at the forefront of that scene. The company’s latest production is the stage adaptation of the well-known 1967 film Guess Who’s Coming To Dinner, which was a much talked-about film in 1967 that deals with issues that are still relevant today, albeit the situations have changed somewhat. Although it does appear dated at times, this is still a vibrant production with a very strong cast and a strong sense of time and place. The time is 1967 and the place is a large, luxuriously appointed San Francisco home. Here, art dealer Christina Drayton (Margaret Daly) prepares for an important meeting with a client, while her semi-retired newspaper editor husband Matt (Anderson Matthews) takes phone calls from the paper and prepares for an afternoon on the golf course. While both express concern about the whereabouts of their daughter Joanna, sometimes called “Joey” (Shannon Marie Sullivan), neither is prepared for when she turns up suddenly with a big surprise. That surprise is her new fiance, Dr. John Prentice, Jr. (Richard Prioleau). Not only is the engagement a surprise, but the Draytons, who are white, are also not prepared for the fact that their daughter’s intended is a black man. The Draytons are then forced to confront their own prejudices as they find the reality harder to deal with than their liberal values would have suggested. There’s also another surprise when Joanna invites John’s parents (Leo Finnie and Perri Gaffney) to dinner without consulting John, who hasn’t informed them that his fiancee is white. The drama here is not simply in the issues, but in the personal interactions and sometimes surprising reactions of the various characters–also including the Draytons’ maid and friend Tillie (Inga Ballard), Christina’s bigoted and haughty assistant Hilary (Elizabeth Ann Townsend), and affable priest Monsignor Ryan (Joneal Joplin), who calls Matt out on his increasingly obvious hypocrasy. This is one of those plays that would be very easy to write an academic essay about, considering the way the issues are dealt with and how the adaptation is dealt with and how it plays to an audience. This is a theatre review, so I’ll spare too much academic detail, although it’s interesting to watch this show–originally written and still set in the late 1960’s–through a modern lens. There are character treatments to take issue with, as well as the obvious character-as-plot-device examples of Hilary and (to a lesser degree) Monsignor Ryan. There was also an odd degree of audience reaction on opening night, in terms of disproportionate and applause in certain moments. The issues that the play raises are still extremely relevant today, but they are sometimes treated in a manner that comes across as obviously of its era, and the gender stereotypes (such as the men being driven by anger and reason, and the women by emotion and empathy) can be jarring. The real highlight of this production is its performances. In a story that hinges on a deeply expressed love between the young couple, the chemistry is crucial, and Prioleau and Sullivan are thoroughly convincing and charming in their scenes together. Prioleau’s performance (when playing opposite everyone but Sullivan) comes across as a bit stilted at first, although that may be an acting choice since his character is nervous and trying to impress his girlfriend’s parents. His later scenes, especially after his parents arrive, are much more convincing and powerful. Matthews and Daly, in roles originated by Spencer Tracy and Katharine Hepburn, are excellent in that they find their own characterizations and don’t try to copy their famous predecessors. Matthews is especially strong as the conflicted Matt, portraying a convincing journey toward understanding. Ballard, as Tillie is another standout, displaying a strong sense of caring and presence, and the always excellent Joplin makes a memorable impession as Monsignor Ryan. There are also fine performances from Finnie and Gaffney as John’s bewildered parents, and by Townsend as the villainous Hilary. Some of the strongest moments come toward the end of the play,when most of the characters are on stage together, reacting to one another with convincing energy and conviction. The late ’60s atmosphere is also well effected by Kevin Depinet’s sumptuously detailed set, and Myra Colley-Lee’s colorful costumes. The staging choices by directer Seth Gordon also add to the drama, using the large set to full effect. It’s a convincing adaptation of a classic but somewhat simplistic film, opening up the drama and making it a little more immediate and relatable to modern audiences. It’s sure to provoke thought and conversation about how racial tensions were dealt with in the past compared to today, and of how far we still have to go as a society. It’s an intriguing start to the 2015 theatre season in St. Louis.